Sergio Ramos is not the type of player that keeps people on the fence. You either love him or you love to hate him. Say what you like though, because his career achievements speak entirely for themselves. To celebrate his style and leadership Nike introduce the Tiempo Legend 7 ‘Corazón Y Sangre’. Sergio Ramos joined Real Madrid in 2005, and since then his instinct-driven football and passionate leadership have made him one of the greatest defenders in history and almost certainly the best current defender in the world. Ramos is the born leader, because while playing alongside him you can’t avoid being inspired by his bold style of play and the sheer amount of passion he puts into the game. The definition of blood, sweat and tears. The boot is named ‘Corazón Y Sangre’, which translates to ‘Heart & Blood’. It symbolises the two aspects of Ramos’ play that define him as a player and personality. His heart makes him battle to the end and at the same time he would gladly give his blood for Real Madrid and Spain. The confident captain, but also the ultimate warrior willing to put his body on the line. Sign up through this link to get an early heads up via email, when the Nike Tiempo Legend 7 ‘Corazón Y Sangre’ launches on our site. Will help you with the very Limited Edition drop! The boot itself is the lush Tiempo Legend 7 just as Sergio Ramos loves it, while the visual design details on the boot are what take it to a completely new level. The Kangaroo leather upper is mostly a pearl white colour, which is inspired by the colours of the Andalusian horse. The horse is a symbol of power and strength in the region and famous for its incredible athletic ability. Does that sound familiar? 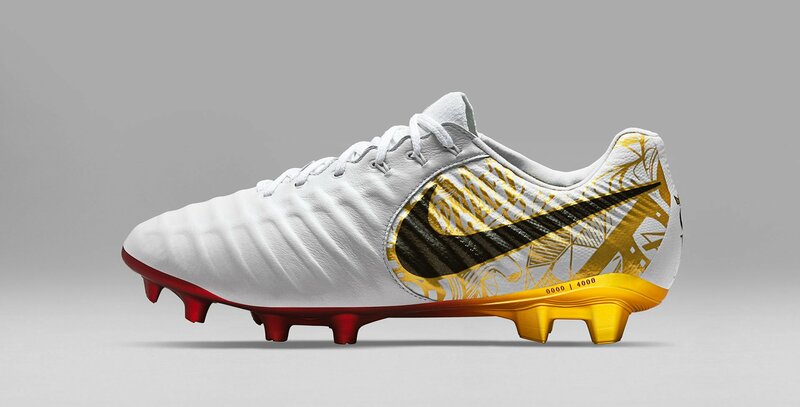 On the heel of the boot, Nike have placed the new Sergio Ramos crest, which was designed for this boot specifically. The beating heart logo and its strong interpretation brings in elements like his ability to score late game winning goals, his Andalusian roots with the horseshoe, as well as his devotion to his family with the names of his sons referenced. Flip the boots on the side and you’re met by one of the best looking soleplates of all time. The design has been given a gradient treatment, which means it transitions from an intense matte red to gold. The red symbolises Ramos’ blood and the gold stands for the way his passion results in success and trophies. The ‘Corazón Y Sangre’ joins a long line of prestigious Tiempo Limited Edition boots, with incredibly popular models like the ‘Totti X Roma’ or Pirlo boot coming before it. This boot will be equally hard to get a hold of, as just 4000 pairs are being released worldwide. They will be individually numbered, but just don’t count on picking up pair number 0004, because they have already been given to Real Madrid’s legendary number 4. Sign up through this link to get an early heads up via email, when the Nike Tiempo Legend 7 ‘Corazón Y Sangre’ launches on our site. Will help you with the very Limited Edition drop.